Apple announces new iPad Air and iPad Mini, both with Retina displays | What Hi-Fi? 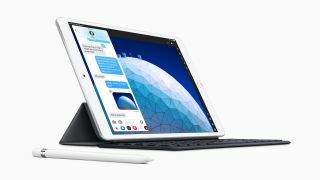 Apple has just announced new iPad Air and iPad Mini models, both of which get Apple Pencil support, Retina displays, increased power and relatively affordable (for Apple) price tags. The new iPad Air has a 10.5in screen with a 2224 x 1668 resolution, giving it a pixel density of 264 pixels per inch (ppi). By comparison, the standard iPad, which continues alongside the new model, has a 9.7in display with a 2048 x 1536 resolution, which equates to an identical 264ppi. Despite the extra screen real-estate over the standard iPad, the iPad Air is barely any larger, at 25.1 x 17.4 x 0.6cm compared to 24 x 17 x 0.8cm. It also has the A12 Bionic chip, whereas the standard iPad still has the two-generations-old A10. There's a dedicated Smart Keyboard available for the iPad Air, too. Predictably, the iPad Air is more expensive than the standard iPad, at £479/$499 for the wi-fi model and £599/$629 for the version with cellular data. Those prices are for 64GB of internal storage - upgrading to 256GB adds £150/$150 to both prices. The standard iPad starts at £319/$329, by comparison. Is the Air worth the extra? We'll answer that very question when we review the new iPad Air very soon. The iPad Mini has finally been lavished with some attention, too. The outward design is more or less unchanged, but the 7.9in screen now has a Retina-grade resolution of 2048 x 1536. That equates to a pixel density of 326ppi, which is actually the highest of any iPad in the current range. That could make it a magnificent on-the-go movie machine. It's also been upgraded with the A12 processor, so is significantly faster than the outgoing model. That should make it a better games machine than before and open up more possibilities for the creative types who might also appreciate the added Apple Pencil support. The iPad Mini starts at £399/$399 for the wi-fi only model and £519/$529 for cellular, and upgrading from the default 64GB to 256GB will again set you back £150/$150. Both the new iPad Air and iPad Mini are available to order now, with deliveries starting next week. There's also an Apple Event confirmed for later this month, with Apple inviting journalists to a launch on 25th March, most likely for the much-anticipated Apple streaming video service.